Saks - I've gone to a new home! I'm an 8 year old short haired boy looking for the purr-fect human to care for me and let me rule their roost. I came to Riley County Humane Society terrified and in poor health. But, once my fabulous foster started me on insulin, my health improved greatly! Since then, I've warmed up to my foster mom and become a very affectionate, friendly and playful guy, as long as things in my environment are just right! I love to be loved on and am very good at using my body language to let you know when play time is over. I haven't been around dogs yet, so I'm not sure if we'd get along. Some cats intimidate me and cause me to get a little scared. If you have any questions about me, just email cat-coordinators@rchsks.org! Bullet - I've been adopted! I'm an eight month old silver short haired kitten. Very outgoing and talkative. Oh, yes, even with my injury, I've got lots of energy and am very playful. When I was just a kitten, I was hit by a car which left my front paw paralyzed. I used to not be able to use my whole front arm, but I've been improving a lot since then. I still can not walk quite normally, and will always have a funny front paw, but that doesn't slow me down. I just love to run and jump. I enjoy the company of other cats, and though I haven't met any dogs yet, I may just do very well with cat friendly dogs. Bottom Line: I've very adorable and adaptable and should do well in an active home. If you can't adopt me now, would you be my Guardian Angel? Sissy - I've been adopted! 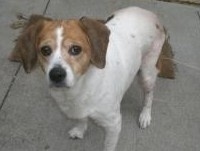 Sissy is a happy and playful senior beagle. She was the faithful and loving companion of a homeless woman who was forced to give her up when keeping her finally became impossible. Unfortunately, Sissy has a kidney problem that requires a special, somewhat more expensive, prescription diet. Because of her age and her special diet she has been passed over for adoption and needs a Guardian Angel to help care for her in her golden years. Midnight - I've been adopted! My name is Midnight. I'm a Special Needs Tudedo Kitty. I've just finished having a beautiful litter of kittens who have all been adopted. Thank goodness I found the Riley County Humane Society, because they not only found homes for all my beautiful babies, but have also spayed me and given me all the shots I need to stay healthy. I’m quite happy living with dogs and cats, but I've never been around children, so I’m not sure how I’m going to feel about them. If you can love a special cat like me, please go to our 'Adopting a Pet' page to fill out an application. I'll be waiting. If you can't make me part of your family now, could you sponsor me? Be my Guardian Angel? I may be at RCHS a while waiting for my special family to find me, and your help will keep me safe until they do. Thank you for thinking I'm special.